I painted three new still life oil painting fruits, ACEO, this week that’s ended and I listed them up on eBay . As you can see, there are realistic paintings of cherries and a pear. 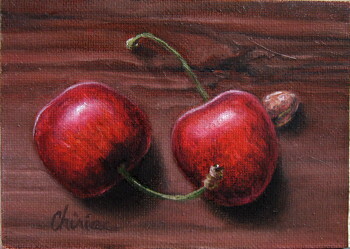 The first miniature painting is a still life of two cherries and a pip. The cherries are laying down on a table so that it may appear like an yin and yang sign. As a balance to them I’ve painted a pip, too. 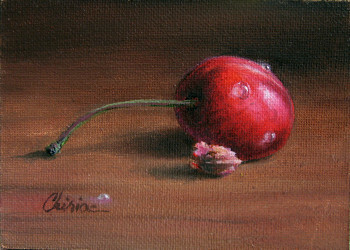 The second fine art miniature oil painting is still about a cherry only that is a single one. Again, for the sake of making the composition more interesting, I painted a cherry pip and some water drops. 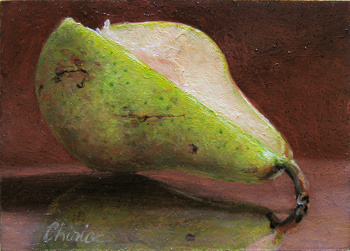 Last but not least , the fine art miniature oil painting is a one of a green pear from which a slice was cut.